A full mouth restoration, also called a full mouth reconstruction involves many procedures that may include dental implants, dental crowns, cosmetic dentistry, veneers and even dental surgery. Important considerations include the price of the procedures, the quality of the dentists and dental surgeons and your current oral health. Finding the right dentist in Costa Rica can be challenging. At ConfiDental Costa Rica, we’re here to help you make the best choices for your long-term dental health. We’re so good that CostaRicaDentalGuide.com named ConfiDental one of the best full mouth reconstruction clinics in Costa Rica! As the name implies, full mouth reconstruction refers to rebuilding and/or replacing all of the teeth in a patient’s mouth. Full mouth reconstruction combines esthetics with the science of restorative dentistry to improve the health, function, and beauty of the mouth. Are you a candidate for a full mouth restoration? Do you have multiple missing teeth, numerous teeth with large fillings that are failing or exhibiting decay, cracked or broken teeth, or badly worn teeth due to habits like teeth grinding, or a genetic tooth disorders? If so, you may be a candidate for a full mouth restoration. A full mouth restoration is more than just a smile makeover. A smile makeover is performed primarily to improve the aesthetics of your smile and may last for several years or more. 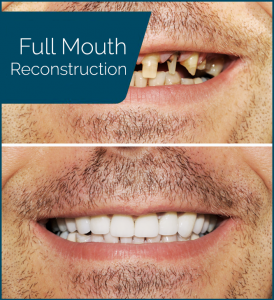 A full mouth reconstruction is a reconstructive transformation that will last a lifetime. A full mouth restoration is complex procedure that should only be performed by dentists with the proper training. Few dentists have the technical knowledge to perform a full mouth restoration. At ConfiDental, Dr. Garita and his team have performed hundreds of these complex restorations. which will save you 50%-80% or more, when compared to rates in the USA and Canada.